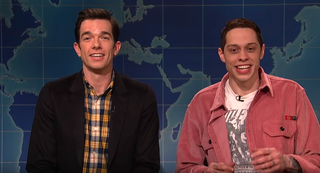 The last time we saw Pete Davidson on Saturday Night Live, it was an understandably brief appearance, introducing musical guests Mark Ronson and Miley Cyrus. Understandable because, earlier that Saturday, an unsettling internet post from the publicly troubled Davidson had a lot of people worried for his safety. Well, 2019's a new year, and Davidson had plenty to do on last night’s Rachel Brosnahan-hosted SNL, which had fans and those concerned about a young man struggling with his mental health in one of the most high-pressure, high-visibility show business jobs there is feeling relieved. And, luckily for Davidson, and us, he brought along some very funny help. Onto The Mule, which the duo eagerly saw on opening day, and which Mulaney called easily of equal insanity to that time Eastwood “berated and empty chair” at the Republican convention. Calling the movie essentially “a superhero movie for old people,” in that Clint’s 90-year-old man can drive unsupervised, and can do any job better than a Mexican (even drug smuggling), Mulaney and Davidson also noted that Eastwood’s character (who, again, is 90) has not one but two threesomes in the course of the movie. (“And he directed it!,” beamed Mulaney, in gleeful bafflement.) Basically the whole five minutes was a delightfully funny break from a middling SNL, so howsabout having these two on Update to review a different bonkers blockbuster every week. Good for Pete, good for SNL—good for America.